We’ve had several concerned emails and questions upstairs. The simple truth is that I’ve been out sick with the weirdest virus I’ve ever had and Lindsay has been overrun trying to keep up. Sorry, guys. Sandy Kay and I are working on our next tutorial: Duplicate Stitch; but she’s been busy catching up this week, as she was out of town for a week and half. We’ll get there, honest! 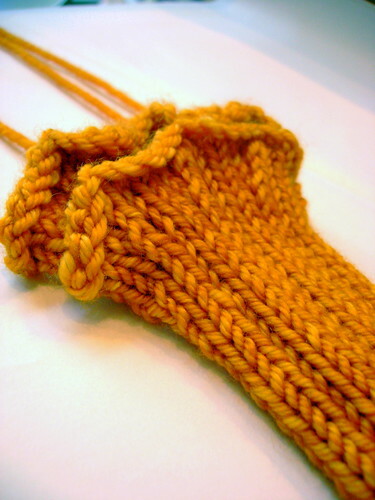 Knit with the laceweight bamboo XS-45, from Habu Textiles. On size 000/ 1.5mm needles! He made up the pattern and is just going for it. There’s no way you can not be impressed by this. It, quite honestly, looks (and feels) like something you’d buy in a high-end boutique. The man is brilliant (and a little crazy). We’re trying to convince him to sell the pattern to Twist Collective or Knitty. Keep your fingers crossed. Aaaawwww, so sweet! The little one was knit with two colors of Malabrigo Sock held together, using the Knitting Pure & Simple pattern “Little Girl’s Shrug” (coming to the website soon!). 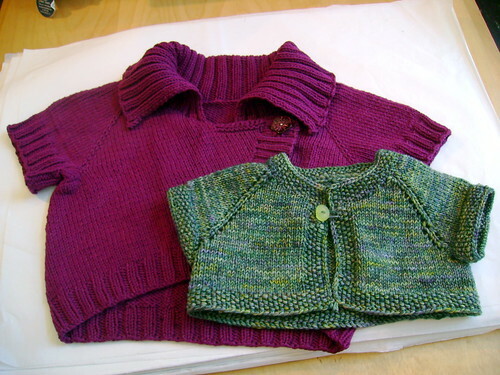 The larger was knit with Cascade Sierra, following the pattern “Children’s Neck-Down Bolero”. 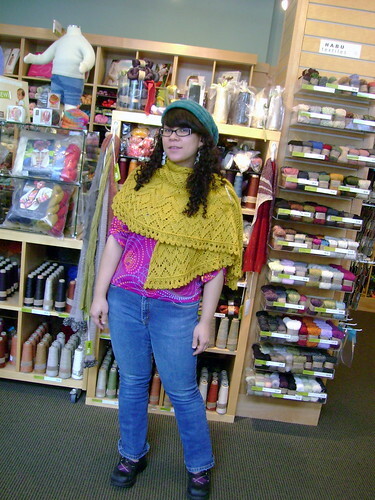 You can get more information about the sizing, colors used, and her notes on her ravelry notebook. 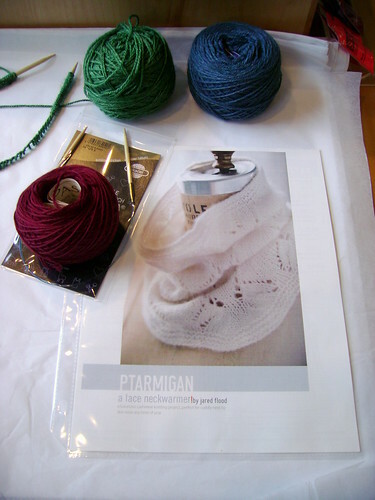 And, you can also check out the very cool Aran Necklace camisole she’s making (from Interweave Knits), using Habu Textiles Tsumugi Silk and Louet Euroflax Sport held together (yummm). Jared Flood’s Ptarmigan. Gone horribly wrong, don’t ask. And then, of course, there’s the enormous Liesl I’m trucking away on (dress, anyone? ), and can’t bear to haul in anymore. I’ll wear it in when it’s done, honest. Lindsay and I, your faithful (if sometimes tardy) bloggers have been knitting… just nothing we can blog about yet (unless you really do want to see 140 cast on stitches and not much else…). 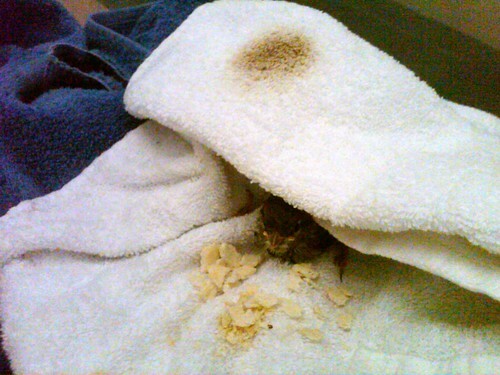 In lieu of other staff projects, how about a cute baby bird photo? 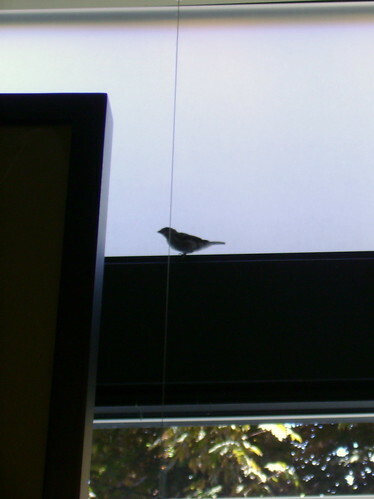 He (or she) had no trouble flying in through the door, but couldn’t quite figure out how to fly out. So, after an hour of trying to coach him (her?) out the door, we finally caught the poor thing and released it outside. We can’t help but wonder if it’s the same bird – now affectionately referred to as “Birdie”. After all, it was waiting on the doorstep and flew in as soon as I opened the door, silly thing. Maybe s/he wanted more crackers. What do you think – same bird or not? Of course! Sparrows love crackers. Who cares? Show us some more knitting! Just because Check back later this week (Wednesday, maybe) for another post (we have a lot of customer and staff projects to catch up on!) and another edition of Fashionknitsta. 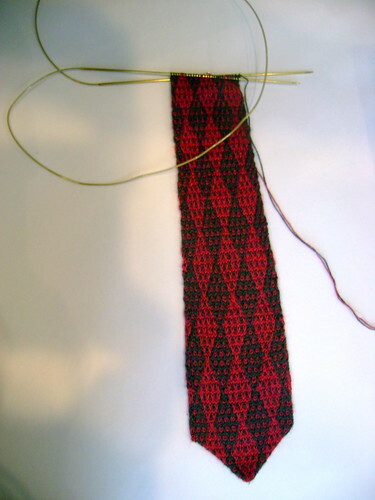 Hopefully, I’ll be able to corner Sandy Kay before TNNA for that tutorial, too. ‘Til then, happy knitting! The post Resurrection appeared first on Knit Purl Blog.